Groups WooCommerce offers several general settings that can be adjusted. 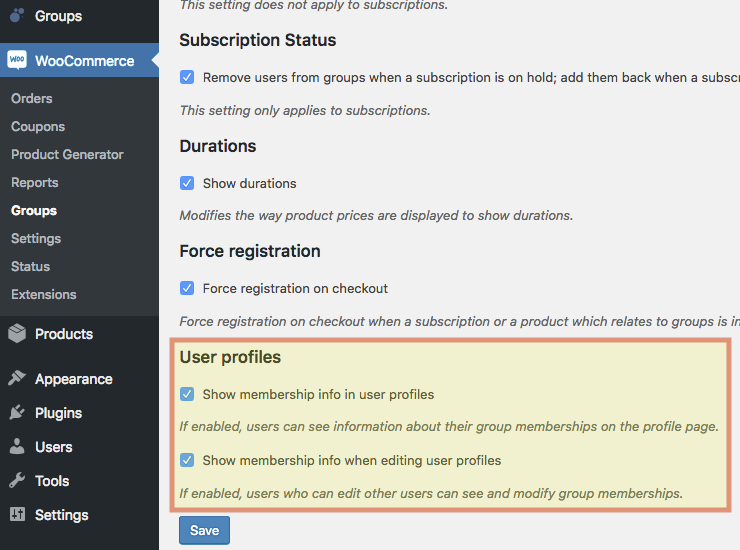 Go to WooCommerce > Groups to review or adjust the current settings. Order Status : By default, users are added to a group when the order status is Completed. Depending on your order process, you might want to adjust this. Please refer to the details on this option below to decide which option is more suitable. User profiles : If you would like to see group membership info when viewing or editing a customer’s user profile on the administrative back end, you can enable this option. Please refer to the detailed instructions given below to show this information. This is relevant for products that add users to groups – users can be added as early as an order is processing or when an order is completed. The same applies to users being removed from groups. Note that this setting does not apply to subscriptions. In some cases, you might want to consider having the users added earlier, when the order status is Processing instead of Completed. For example, if you sell physical goods and grant customers access to user manuals on protected pages, you can allow them to access the manual even before the physical good has been shipped. In such a case, you can set this option to Processing, which would add the customer to the corresponding group as soon as payment has been received and before you have marked the order as completed. Remove users from groups when a subscription is on hold; add them back when a subscription is reactivated. This setting affects the way group memberships are handled when a subscription is put on hold or reactivated. The setting is only effective for subscriptions provided through the WooCommerce Subscriptions extension. Unlimited or time-limited simple or variable products with group assignments are not related to this setting. When enabled, shows information about durations along with product prices. When this option is enabled and a product that adds a user to a group is in the cart, the customer is required to log in or register to complete checkout. At checkout, the customer will be required to create an account or log in if she or he hasn’t done so already. In this section you can enable two options that will display membership info on user profile pages on the back end. Recommended – If you would like to edit or set group memberships on user profiles, also enable the option Show groups in user profiles under Groups > Options. With this option enabled, users can see information about their group memberships on their profile page. Please note that this option is only relevant if your customers are able to access their back end profile page from the WordPress Dashboard. As access is disabled by default from WooCommerce and if you would like to show membership information, you can consider adding a Shortcodes to one of the pages accessible to your customers. When this option is enabled, users who can edit other users, for example those with the role of an administrator, can see and modify group memberships. Here is an example from a user who is assigned to the standard Registered group and a Test group. The duration for the Test group can be edited. If you have enabled to show membership info but do not see the section Group Memberships on a user’s profile yet, click the Update User button. 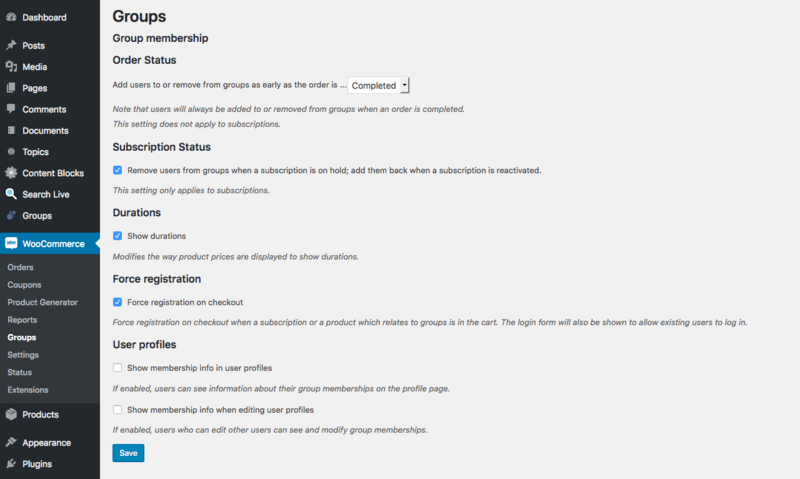 The section will now appear and allow you to edit group memberships manually (except for the Registered group).